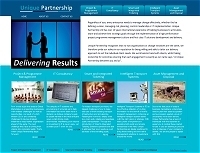 Ampheon were recently commissioned to design a brochure web site for Unique Partnership, a London-based IT consultancy. The company wanted a small brochure web site to support their offline marketing activities and were particularly interested in a website design company providing London web design services. Ampheon fitted the bill and just a short while later the site was ready for launch. Unique Partnership bring over 10 years' experience to the IT consultancy arena in areas such as project and programme management, smart and integrated ticketing, intelligent transport systems and asset management and disposal. The new web site can be viewed at: www.uniquepartnership.co.uk. If you would like a new or redesigned website, contact us today for a free no obligation quotation.